You should end up with a smooth, glossy mixture referred to as ganache. Add the Tahitian Vanilla Balsamic to the ganache and mix thoroughly. The ganache will thicken as it cools and when it reached room temperature, can be piped. 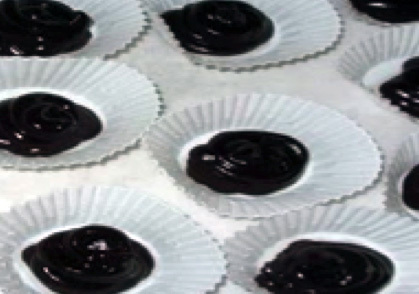 warm, the ganache can be poured over cakes or used to dip fruit. To make traditional truffles, pipe small portions ( approximately 2 tsp.) of ganache on to parchment paper or another non-stick surface. These portions will continue to cool and solidify and can then be rolled in to small balls. Dredged the balls in to cocoa powder. If used while warm, the ganache can be poured over cakes or used to dip fruit.